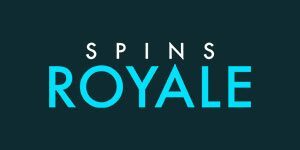 Spins Royale Casino will then reward you with a bonus (Welcome Bonus is for new players only). The terms and conditions of the bonuses vary between different casinos and might also change over time and between different countries, so it is important to compare the different offers and read the T&C for Spins Royale Casino before signing up. Spins Royale is another Nektan-powered online casino on the market. Launched in 2017, the casino has already established a very good reputation among gamblers thanks to its wide selection of games provided by some of the biggest names in the industry. You can easily guess from its name that it focuses on slot players, yet those who prefer other forms of entertainment including live dealer games won’t be disappointed either. Being mobile-ready, Spins Royale can be accessed from smartphones and tablets too without any losses in the quality of the games. The gaming establishment uses a standard Nektan layout allowing players to browse it easily whether they use their desktop or mobile device. The games come organised into categories with the most popular titles featured in the Player Favourites section. Holding the licences issued by the Government of Gibraltar and UK Gambling Commission, the casino is a safe and fair gambling destination. It welcomes its new customers with a set of 100 free spins for one of the most popular slot titles Starburst while existing customers can make use of various promotions and tournaments taking place on a regular basis. Accepting players from all the corners of the world, Spins Royale is available in English, Swedish, German, Norwegian, Italian and Finnish. 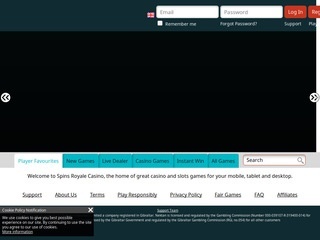 The RNG-operated games available at Spins Royale are certified for fairness by independent auditors and have Malta, Gibraltar and UK RNG certificates. Payout reports are available on the website and you can find them on the page Fair Games. Running on a multiplatform powered by a range of software providers, Spins Royale offers more than 600 casino games. They are available in instant-play mode allowing you to access them with no download needed. All games except for live dealer tables can be played in demo mode too and you don’t have to be a registered user to give them a try. Some of the gaming companies contributing to the casino’s extensive game collection are Microgaming, NetEnt, IGT, Yggdrasil, Evolution, Pragmatic Play, Big Time Gaming and more. It is funny that Nektan-powered casinos do not offer a Slots section although this type of games constitutes the biggest part of the gaming content. It will be obvious once you enter the gaming venue that you can choose from hundreds of slot titles. In the Player Favourites section, you can choose from some of the most popular releases such as Cleopatra, Starburst or Bonanza. The latest releases like Astro Pug by Lightning Box or Dragon’s Luck Power Reels by Red Tiger Gaming can be found in the New Games section. You can always use the search bar to find the games to your liking by their title. The Exclusive section offers slot machines made in-house by Nektan. Those looking for excitement at virtual table games can visit the Casino Games section. It is home to Blackjack, Roulette, Poker and Baccarat virtual tables you can join whether you play at lower or higher stakes. Some of the tables included are Blackjack Classic, Blackjack Perfect Pairs, Pontoon, Oasis Poker, Punto Banco and European and American Roulette. Players seeking games that award instant wins can visit the dedicated section offering scratch cards, lottery-like games and more. Here you can also find branded IGT slots like Harley Davidson and Breaking Bad. Slingo, a highly popular game in the UK that combines the features of slot machines and Bingo, is also available at Spins Royale. Although at first glance you may think that the casino offers no Video Poker games, don’t let the first impression fool you. Use the search bar and enter the name of the Video Poker variation you want to play. Jacks or Better and Bonus Deuces Wild are among variants on offer. Live dealer games have taken the online gaming industry by storm and you won’t miss them if you join Spins Royale. Its live casino department is powered by one of the leading providers of the games hosted by real-life dealers, Evolution Gaming. Feel the genuine casino atmosphere with the games like Blackjack, Baccarat Control Squeeze, Double Ball Roulette or Caribbean Stud Poker. Catering to players from different parts of the world, Spins Royale makes sure that they can choose from a wide array of convenient banking methods. From Visa, Visa Electron, Maestro, MasterCard, Neteller credit and debit cards, e-wallets such as Skrill and Neteller to Trustly, PaySafeCard and Zimpler, all of them are at your disposal to fund your account and clear your winnings. The casino also supports the mobile deposit-only method Boku that allows players fund their accounts via phone billing. When using it, keep in mind that a minimum deposit allowed is £15 and a fee of 15% is charged on all transactions. To make withdrawals you can also use bank transfer. Processing cashouts may take up to 7 days. Customer support is available through different channels including telephone, live chat and email. You can use the address [email protected] to send your inquiry or complaint and reliable agents will get back to you within 24 hours. If you want your answers faster, use telephone or live chat, but bear in mind that the opening hours are between 08:00 and 00:00 GMT/BST. Consider visiting the FAQ section before you reach for any of the options mentioned above.